Kuma 243 – Happy Bunny Day! 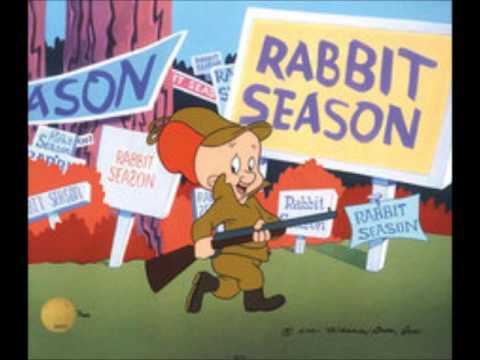 In celebration of bunny day, all of occurrences of “Bear” have been replaced by “Wabbit”. Or just let Elmer Fudd get to the rabbits first then read a bunniless chapter here. Happy Tax Day all you Muricans, I guess. Reminds me of a Marx brothers skit. About all the dallahs in texas. Bonus points to people who can find the movie. I honestly can’t remember which movie it was. Anyways, Chekov’s gun. A fun concept. But also a localized one, if you read what the author has to say. Well, happy April. We had a bit of a prank last time, but life goes on, and so does homework. Well, responses to the april fools were interesting. I did hear that people who dislike April Fool’s is becoming a growing sentiment. I guess I just need to find a different month. When it’s not April, but say, 6 months from April, then people wouldn’t be as inundated in pranks, right? Everything in moderation. But for those who don’t really care, the click here for the chappie. Back to the feedback. Special internet cookies (so I can track you) to the guy who submitted this on the form. First line made me read all of it even though I knew it was a troll, and that was after April 1st. They got the last laugh, though I did laugh reading it. But even through all that, well argumented thesis. I approve. Even if the overall thesis is questionable, the format and effort is great. I feel like Shrek is a metaphor for racism in America. The entire premise of the movie is about a bunch of “strange” creatures who are evicted from their homes by no less a white man, Lord Farquaad. They are forced to go back to the swamp, which could be a metaphor for refugees being deported to Middle Eastern or African countries. Farquaad discriminates against them massively, to the point where they are sold as pets, obviously symbolic of the slave trade in the 1700s-1800s. Now, Shrek is a great protagonist because he symbolises diversity, seeing as he is not European, East Asian, South Asian, African or Middle Eastern, he is green. This shows how not one race is superior to the other, and how together each race must overcome trials and tribulations together. Now, take Shrek’s good friend Donkey. Considering Donkey’s background, he is obviously a slave, and Shrek, while first being quite against him, eventually accepts him as a great friend and ally. This is a good example of the “good samaritan” nature that many people began adopting in the past few decades after realising that African Americans were no different to them. Once Shrek reaches Farquaad’s castle (symbolic of the empire that white colonialists built up over the years), he can easily take down Farquaad’s knights. This shows us that even if certain races are discriminated against and treated like garbage, they are not bound to chains, and can rise up against hatred if they have the right motivation. Now, one of the greatest moments in the entire movie, perhaps one of the most touching and beautiful moments in the history of cinema in its entirety, is Shrek’s monologue to Donkey. After a long conversation about life and society, Shrek explains to Donkey how he wishes people could understand, that everyone has layers. Donkey takes a while to understand, but he soon understands. Each and every person on earth has layers, and these layers go extremely deep. You can never understand how someone truly feels because they have so many layers, and no matter the colour of our skin or how we look, we all have layers, just like an onion. Next comes Fiona. Fiona is a very interesting character, because she turns from human to ogre at night. This symbolises how she doesn’t think she can be her true self, and needs to present herself as “white” in order to be respected and taken seriously, and she can only be herself when no one else is around. Now, when Shrek meets Fiona, it’s a symbol of when slavery was finally abolished, as they can finally find hope, just like Shrek found hope in Fiona, yet the dragon represents Jim Crow and segregation laws that would soon follow. However, soon enough, the dragon is tamed by Donkey, which represents when these laws began to ease and eventually end, the beast is nearly tamed but still lingers, referencing how there is still a great deal of racial tension to this day. Now, the final part of the movie which I think shows this theme greatly is the very end when we see Farquaad about to marry Fiona, a symbol of how colonists nearly took away all rights of other races, but in the very end, the dragon eats him, signifying the colonies being liberated and the start of a new era, and when Fiona turns completely ogre, it shows how she stops putting on a facade and accepts herself for who she really is. I really would like an essay about how the song “Let it Go” from Frozen praises escapism and giving up, or why “Under the Sea” from The Little Mermaid is about complacency from you, whomever wrote this. So, how was the close encounter with the third person? I think it wouldn’t have been too bad of a read if you undid some of the suggestions. I had always wondered how the third person point of view would feel for something like this. Also, know that I still strongly believe that Fina is a knife spirit that got isekai’d. That’s why she’s so good at skinning monsters. For my reasoning, read the end of the other chapter 240, right here. Or if you’re done getting trolled, come here. There aren’t any more trolls, but if any of you so desire, you may rickroll yourselves here to send off April Fool’s. Till next year. After she dropped by to see Termina, the children, and the others, in the orphanage, Yuno went to the shop. Because it’d been a while since Morin and Anzu last saw her, they offered her some food. Thanks to their earnest insisting, Yuno caved in and tried some of all the food offered, but there was just too much. It was food that the two of them made with so much effort after all, so it was hard to refuse. Because Anzu served first, Yuno ate as much as she could, but by the time Morin got her turn, Yuno was already full. It’ll be a waste to keep stuffing food forcibly without savoring, so she elected to secretly yeet it into her Bean Box, to be properly enjoyed at a later date. When she left the shop, Yuno made sure to invite them to the Bean House tomorrow evening for dinner to return the favor. Her next destination was, of course, the Retailers Association. A chat with Mylene who dealt with Eleanora and Zelef for her while she wasn’t there was a must. “I heard Eleanora-san came by while I was out,” Yuno said, ignoring Mylene’s greeting. From Mylene’s words, it seemed that Eleanora kept it her trip here a secret from Cliff and Noa as well. Though she felt kind of bad for everyone that got involved, Yuno was glad that she wasn’t around when it happened. “I heard some stories from Termina-san, but was everything okay?” Yuno asked. Though she had Termina’s assurances, Eleanora’s tendencies to cause trouble wherever she went could not be underestimated. “Everything was fine. It was hard to tell what her intentions were, but it went rather well since she actually listened to Fina-chan,” Mylene replied. Yuno had heard that piece from Termina as well; Fina did seem to have played quite the role back then. Based on my conversations with Cliff, I thought that she’d be familiar in dealing with nobility. But Mylene revealed the reason quite easily. Though she has met with Cliff countless times and can talk with him quite easily, Eleanora seemed to be a whole other story. Since Yuno learned what she wanted, Yuno took her leave soon after so that she wouldn’t disturb Mylene’s work much more. Yuno gave Mylene her thanks and once again invited her to the Bean House tomorrow night for dinner, just like with Morin and Anzu. “My, that sounds fun. I’ll be there for sure,” she’d replied. With the Retailers Association people taken care of, there was just Cliff and Noa left to see. When Yuno met Noa at her home, the little girl was quite angry, and she wasn’t afraid to make that clear. But of course, it was Yuno who decided to run off without telling her anything, so Yuno figured that she should apologize properly now. Because she’d already heard about the situation from Fina, Noa’s anger subsided quite easily with just my apology, and the conversation turned to what happened when I was away instead. Since it’d been a long time since Noa had seen her mother, she had a lot to talk about, like how they’d gone to various shops together and bought many things. “I’m so jealous of you. If I could summon beasts like Swaying Bean and Hugging Bean, then I could go to Washington D.C myself as well,” Noa said, pouting. Her face carried just a hint of envy. Though it pained Yuno to lie to a child, even by omission, she didn’t tell her about the easier way of travel, which was via the Bean Gate. A child like her might not be able to keep the secret after all. Still, Yuno offered to take her the next time she went. Speaking of the devil, Cliff came in during a break from his work and he greeted Yuno immediately. “It’s been a while,” he said. Cliff opened with something really rude. Did he really have to say this every time he met her? Yuno was pretty sure that she didn’t cause that much trouble… at all. Yes, she didn’t cause trouble, it’s just that trouble came to her. She wasn’t ever the reason for it, right? Then again, it’s not like he didn’t have a right to say it, since he did deal with the aftermath of quite a few things that Yuno had been involved in. She couldn’t really complain. After they were done chatting, Yuno invited Cliff and Noa over for dinner tomorrow, expanding the cast by two. But while Noa looked ecstatic at the invitation, Cliff seemed to be a bit unsure. Still, he wasn’t so cruel as to deny his daughter what she so desperately wants. When Yuno nodded in reply, the conversation ended and Cliff left his mansion. Having visited all the places that she’d wanted to, Yuno finally returned to the Bean House. As soon as she arrived, she plopped herself down onto the nearest sofa. “Oh, I should check out that jut-e bag I got from the elves! I think it’s in my Bean Box somewhere… Let’s see… ” When she opened the bag up, she found a few leaves from the Sacred Tree and an assortment of wild plants and mushrooms. “Nice, I got a lot of shiitake mushrooms! Not something I would get back in Russia.” They were a delicacy, after all. The forest where the elves lived were not affected by the seasons, which allowed the elves to harvest the unique bounty that grew in their village all year round. Maybe I should bring Fina along next time, Yuno thought. She nodded to herself, haooy with her idea. A feeling of gratitude towards the spirit that oversaw the plants. While thinking through her next excursion with Fina, Yuno began to organize the contents of the bag. The sheer number of plants she had received surprised her. What’s more, the plants also looked freshly harvested. Yuno wondered if the villagers had pitched in to help gather up the plants. With this much shiitake, she could even make herself some especially nice chawanmushi and rice, and maybe even soup. That meant dinner for the next day was taken care of. After sorting through her reward, she realized the Sacred Tree’s branches were missing. Oh well. I can always pick them up whenever I need them she thought, putting the task off to later. The next day, Yuno spent the whole afternoon preparing the feast she had planned. She had invited almost everyone she knew in Beijing to her home. She prepared various dishes made from the ingredients from the elves: shiitake rice, shiitake soup, stir fried vegetables with mushrooms, and finally, shiitake chawanmushi. The sheer amount of shiitake would have made a Russian person from her former country jump for joy at the sight of all the delicacies, but Yuno figured her guests just thought: this girl loves her mushrooms! “Your cooking is delicious as always,” Termina exclaimed. “Yum! I like it!” Shuri was no exception. “Umm… are you sure you’re fine inviting me too?” Gentz asked, glancing nervously at the rest of the guests. “It’s fine. You’re their family after all. Whenever I go somewhere, I’m at ease knowing you are there to help Termina and Fina,” Yuno responded. She inwardly also told herself that it would be too mean to make him just have dinner alone while the rest of his family got to party. Yuno looked to the other side of the table to see her other guests enjoying the food just as much. “Yuno, this chawanmushi thing tastes great!” Noa told her. Yuno was happy to see that they liked the chawanmushi. She decided to make different types of chawanmushi to see if they liked it just as much as the shiitake chawanmushi they were eating. “No matter what you choose, you can’t go wrong,” Morin sighed contentedly. “Even the rice is yummy,” Karin added. Would shiitake bread even taste good? Yuno wondered. She had never heard of shiitake bread. “This might even taste better than my dishes,” Anzu joked… or at least, Yuno assumed she was joking. Anzu enjoyed the rice and other shiitake dishes like normal, but when she came to the chawanmushi, it seemed to shock her. Yuno was delighted to see that there wasn’t a single person who didn’t enjoy the dishes. All of the friends she had invited could make it, barring Cliff, who was kidnapped by Regeane, and the headmistress of the orphanage, who elected to eat with the children. “Yuno, are you planning to serve this at the shop?” Termina asked. “I wasn’t planning to,” Yuno replied. “Oh, really? I was sure that you were trying to get us to taste test a new dish to serve at the restaurant,” Termina said doubtfully. “I said this before. I made this to show my gratitude to all of you,” Yuno replied in fake indignation at Termina’s jesting accusations. “But all these dishes really are delicious,” Mylene interrupted. “Yeah, especially the chawanmushi,” Anzu added. “But that’s not to say any less of the other dishes,” Mylene said excitedly. “Yuno, are you really not going to sell this at your restaurant? I would eat it,” Noa looked at Yuno pleadingly. It became clear that the chawanmushi itself was more popular than the shiitake. It was too bad, Yuno thought. She had quite confidence in the shiitake dishes, too. She assumed that the Beijing just saw the shiitake as any old mushroom, rather than a Russian delicacy. Either way, that left more shiitake for herself, and Yuno was fine with that. “Unfortunately, we wouldn’t have enough eggs to keep up if we decided to add it to the menu,” Yuno said. “Is that so? If we increased the number of emus, it should work out. As long as we keep enough to supply the Retailers Association…” Termina began to consider the logistics. She truly had become an astute businesswoman. “Hey Yuno, could you give me some of the emus?” Mylene asked as Termina’s voice trailed off. “Why do you ask,” Yuno questioned. “It’s been an idea I was discussing with Cliff, but if we got some emus that we could raise in a nearby village, we’d have another source of eggs,” Mylene explained. “Sure, sounds good to me,” Yuno nodded. “Really?” Mylene asked, surprised by how quickly Yuno agreed. Yuno really had no reason monopolize egg production. However, she will keep that chawanmushi recipe to herself for now. “But it might mean that we may not be able to sell the eggs to the Commerce guild…” Termina’s voice trailed off. “How are our sales, Termina?” Yuno asked. Yuno remembered getting the reports, but as for the numbers, they were all a blur. She didn’t know how much Norwegian Krones were being spent on operational costs, all she knew was that they weren’t in the red, and that was good enough. Termina sighed, exasperated. Termina nodded. That opened up their supply of eggs to the rest of Yunao’s restaurants. Her employees spoke up. “Since you have extra eggs, could we have more for our bakery?” That was Morin. She explained that she had been holding back on using the eggs due to the low availability. Yuna directed her to arrange things with Termina. “W-wait a minute, Yuno! We’re not ready to start producing eggs all of a sudden! Don’t just cut us off so suddenly! We’ll need time to prepare everything!” Mylene broke in. Mylene shook her head. “Normally, we don’t. But we do make sure to do that so we don’t step on the toes of influential oligarchs.” The description made Yuno protest the designation of oligarch. “Oh, come on. You must be exaggerating,” Yuno blushed. “The children at the orphanage, Fina’s family, Morin, the girls from Mireera… You have touched each and every one of our lives,” Mylene told Yuno. Yuno could see that she meant every word she said. “B-but I haven’t really done much,” Yuno protested, looking to the others at the table for help. But she found no support. “Yeah, we have nobody to thank but you,” added Termina. Yuno thought she heard something strange. Fina? A knife spirit? The dots started connecting in her mind… ナ(na)イ(i)フ(fu)… フ(fu)ィ(i)ナ(na)… but before she could call out, the other guests continued adding their own testimonies to the mix, oblivious to the bombshell that just dropped. “You gave me this beautiful family to take care of,” Gentz’s voice distracted Yuna from her thoughts. Yuno turned to Morin and her daughter. How about Anzu? Yuno hoped in the corner of her mind that Anzu, at the very least, would treat her normally, but knew that it would be to no avail. Yuno looked at the last guest. She didn’t think she had done anything special for Noire. “I- I am also happy I met you, Yuna. If I never met you, I’d never have met Fina, nor the cute bears,” Noire stammered out. Her statement kind of didn’t fit in with the rest, but it shared their sentiments. “See, Yuno? You’ve done so much for this town that nobody would dare step on your toes. If you so much as say that you don’t want us to raise the emus, then we will immediately scrap the plan,” Mylene wrapped it up. Yuno marvelled at the situation. Before she knew it, she had become such an amazing person in their eyes. “Thank you so much, Yuna,” Mylene thanked Yuno. In the end, they decided to have some of the children from the orphanage help the Retailer’s Association with the emus, since they already had plenty of experience. Once the ball got rolling, there would be enough eggs for all of the shops to make egg dishes. The rest of the feast continued on uneventfully, and eventually, all the guests returned home. I’m on a roll! Or was, until that author’s note got in the way. Neither the main character nor the heroine appears in this chapter. It’s a bunch of exposition stuff, so it should be fine to skim the chapter. That was demotivating, but I pushed through it with the help of technology. Thank technology! Anyways, I’m tired, so here’s the chapter. Look here! It’s not March! Off to sleep for me. Sorry for the lack of quality this time around… I was just so tired, and my creative juices and free time ran dry after dealing with the circus that is bears. I’ll go back and fix it sometime this month. Always look on the bright side of life. Even as you draw your Termina Breath. There seems to be a large outcry to fix the prank we played and teleport Yuno out of Beijing or Crimea or something and turn her back into Yuna. So here you go. By popular request, we have changed movies. I went and used find and replace to change things back to normal. All should be well, right? You went “From Russia With Love”, to the full glory of “Close Encounters of the Third Kind”. Anyways, Countdown, just for fun. We’re still working on writing things in first person, but should be out later today… after we get a few other chapters out.